Read the Report on What makes housing accessible to everyday destinations in Southern California? Changes to the urban built environment have impacts on the social and ecological footprint of cities and regions long beyond their original planned lifespan. In particular, urban sustainability, transportation energy use, and community well-being and cohesiveness are largely determined by development decisions that led to the way our cities are arranged. This research explores the notion of urban accessibility, defined as the spatial separation between dwelling units and 32 types of destinations including shopping, open space, and public services. 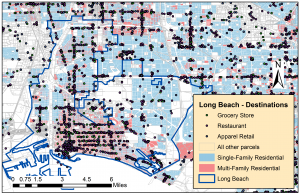 Using data on the roughly five million residential land parcels in Southern California, we use network analyses and multilevel regression modeling to determine what it is about homes that make them more or less accessible to a wide variety of destination types. In most places across the region, older homes, smaller homes, and multifamily residences have a positive relationship to accessibility; however this varies widely across counties and cities.